Good morning from beautiful and freezing Hamburg. We’re still waiting for the first snow and hopes for white Christmas as every year. Anyway, we hope you enjoyed the weekend and wish you a good start into the new trading week. The week began very JPY friendly as we saw gains versus the USD and EUR on concern the European credit ratings will come under further pressure if Dubai World will default on debts. “The funding currencies will benefit from the reversal of carry trades” said a Broker in Tokyo. The JPY is poised to replace the USD as the top funding currency for investments across the world after the borrowing costs in Japan became as cheap as in the United States for the first time in four months. The Japanese Tankan index of sentiment, which displays the confidence among the largest manufacturers, increased nine points to minus 24, the Bank of Japan said today. A negative number means pessimist outnumber optimists. The AUD/USD as well as the NZD/USD weakened for the second day after a U.S. report showed last week that the national retail sales and the consumer confidence rose faster than expected. “The market is starting to think about Fed policy and whether we might see the Fed hike rates a lot sooner than what people had factored in”, said Khoon Goh, senior economist at ANZ National Bank Ltd. in Wellington. At the beginning of its youngest bearish trend-line we can see that the Bollinger bands contracted like a bottle neck, which boosted the trend and assist the bears to cross the important support-line at 1.4806. 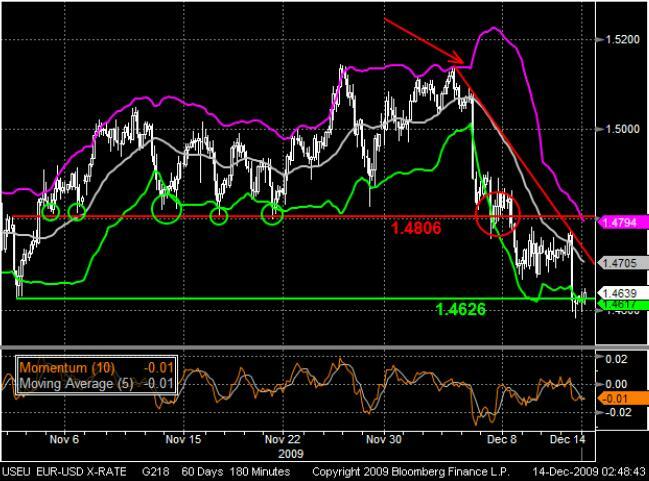 After this line was crossed the EUR/USD boosted its downward trend once again and fell near to its long-term support around 1.4626, where it is looking for a new basement. Also the Momentum crossed its moving average and may indicate the end of the bearish rally. Having the USD/JPY recovered from its monthly low it rose up to the 76.4% Fibonacci retracement line. 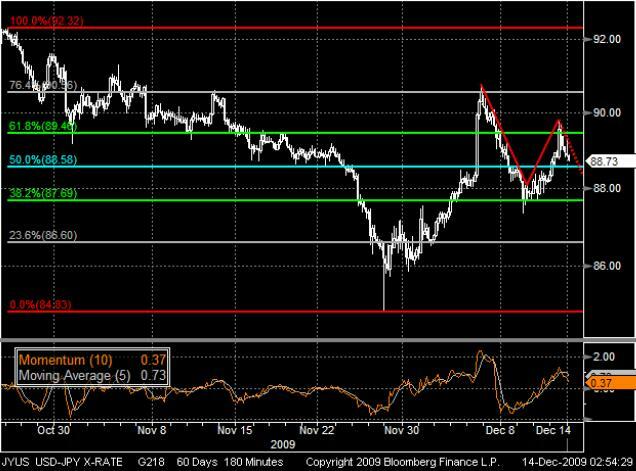 After touching this line the currency pair rebounded again and crossed its support lines at the 61.8% and the 50% line. Like a zigzag movement the USD increased near the 61.8% and tumbled again. This may lead to a flag movement and in considering of a falling Momentum indicator we have to allow for further bearish moves.